We will also provide some dishes prepared with several of the herbs we'll be talking about during this workshop. Y'all come and taste! This workshop is free and open to all! Please RSVP by calling Zanetta Augustine or Dawn Mellion-Patin at 225-771-2242 as soon as you can. Baton Rouge, LA - The Southern University Agricultural Research and Extension Center will host its 44th Annual Horse Show and Trail Ride, April 11-13 at the Maurice A. Edmond Livestock Arena in Baker, Hwy. 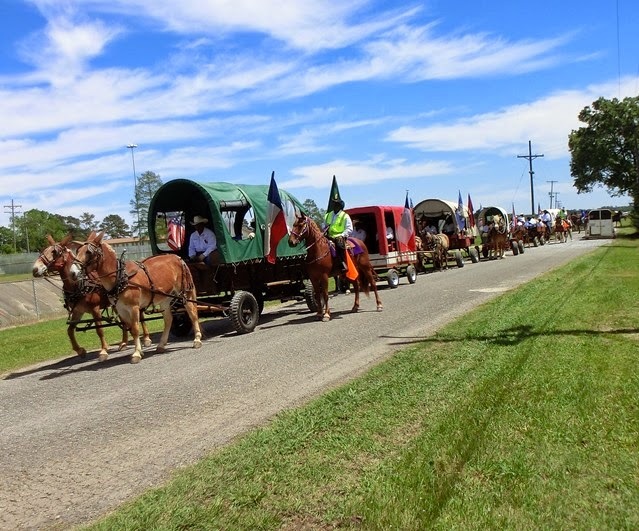 61 N. Trail riders from as far away as Texas, Mississippi, and North Louisiana will gather in Baton Rouge for the event. 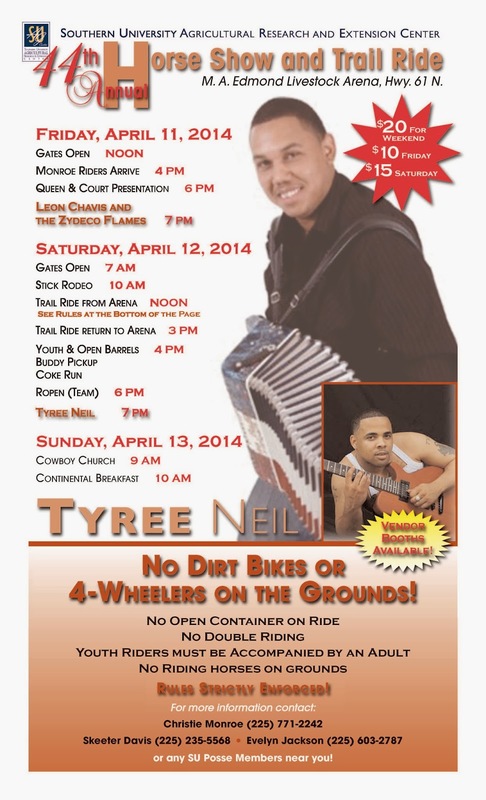 Gates open at noon on April 11, 2014 for arrival of riders. Leon Chavis and the Zydeco Flames will perform at 7:00 pm. The horse parade with participating riders of all ages will gallop around the Baker area with different horse riding associations. From the parade participants, the first and second place winners will be selected by judges to receive various prizes. The show concludes on Sunday with Cowboy Church and Continental Breakfast. This family-friendly event is open to the public. There will be a $20 gate fee for the weekend, or $10 for Friday, and $15 for Saturday only. No dirt bikes or 4-wheelers will be allowed on the Show grounds. Open containers and double-riding are Not Allowed on rides. Youth riders must be accompanied by adults. There will be no horse riding on the grounds. These rules will be strictly enforced. For further detail, please contact Christie Monroe at 225-771-4350 or via email: christie_monroe@suagcenter.com; Skeeter Davis at 225-235-5568; Evelyn Jackson at 225-603-2787. 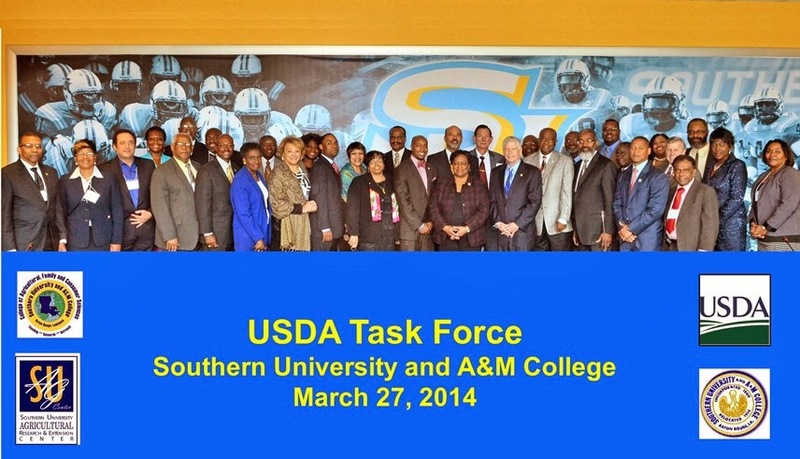 Baton Rouge, LA - The Southern University, Baton Rouge Campus hosted one of the series of the USDA/1890 Task Force Meetings on March 27, 2014. The role of the Task Force is to bring together USDA officials and 1890 land-grant university leaders to discuss and provide guidance about issues of mutual interest to USDA and 1890 Institutions. This joint effort aims to ensure that the partnership between the two entities is productive through the use of collaborative research, grant and employment opportunities for students, faculty, and research staff. The group meets four times a year in diverse locations across the nation to work and initiate opportunities in research, extension, research, academics and capacity-building. Membership in the task force consists of 11 USDA officials, seven 1890 institution presidents and three ex-officio members, with the executive committee serving as the administrative arm of the task force. The meeting was called to order at 8:00 am by Dr. Juliette Bell, Task Force Co-chair and President of University of Maryland, Eastern Shore, and Mr. Thomas Tidwell, Co-chair and Chief of US Forest Service. 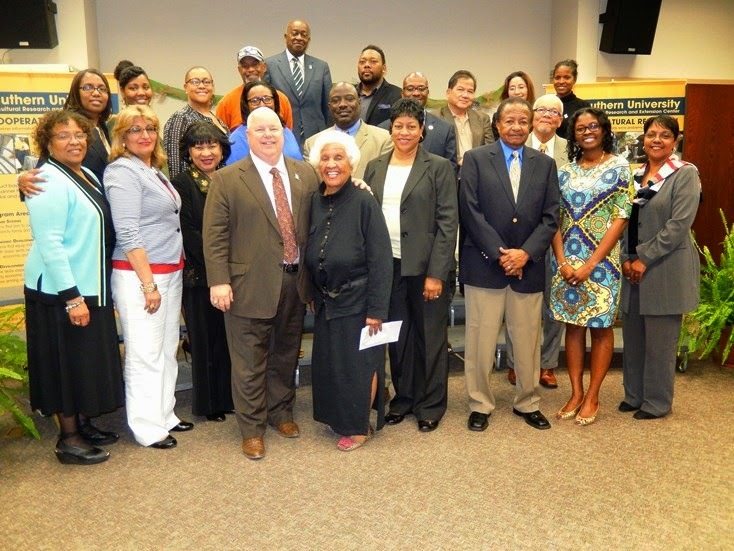 Immediately following was a report on the 125th Anniversary celebration of the Second Morrill Act by Dr. Bell. 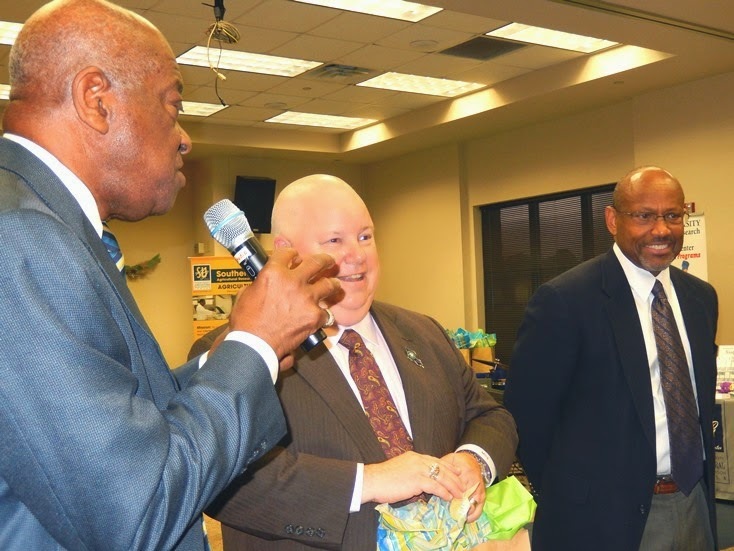 The welcome and orientation was brought by Dr. Joe Leonard, Assistant Secretary for Civil Rights, USDA and Dr. Ronald Mason, President of the Southern University System. 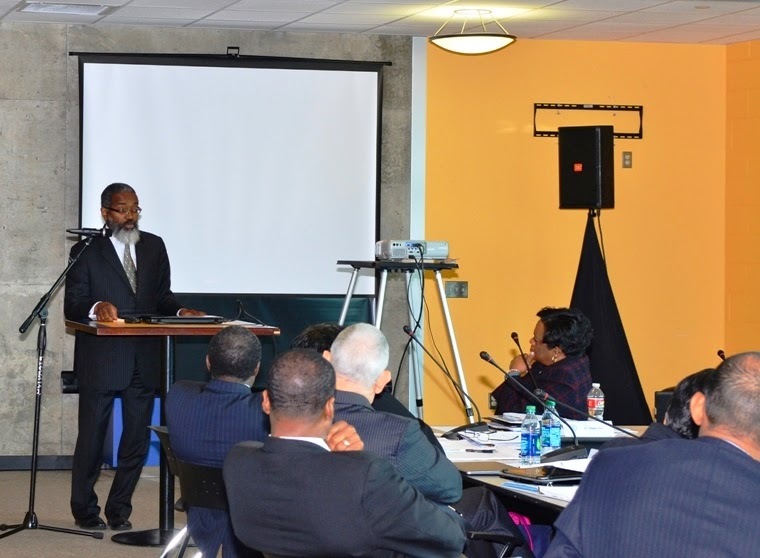 Dr. Gregory Parham, Assistant Secretary for Administration, USDA addressed the team, followed by a report by the Executive Committee. 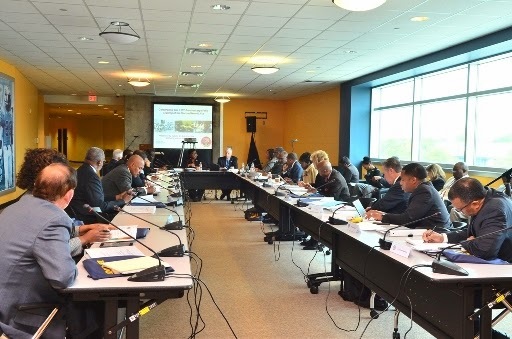 The Executive Committee is co-chaired by Ms. Angela Coleman, Associate Deputy Chief, US Forest Service; and Dr. Moses Kairo, Dean, Agricultural and Natural Sciences, University of Maryland, Eastern Shore. 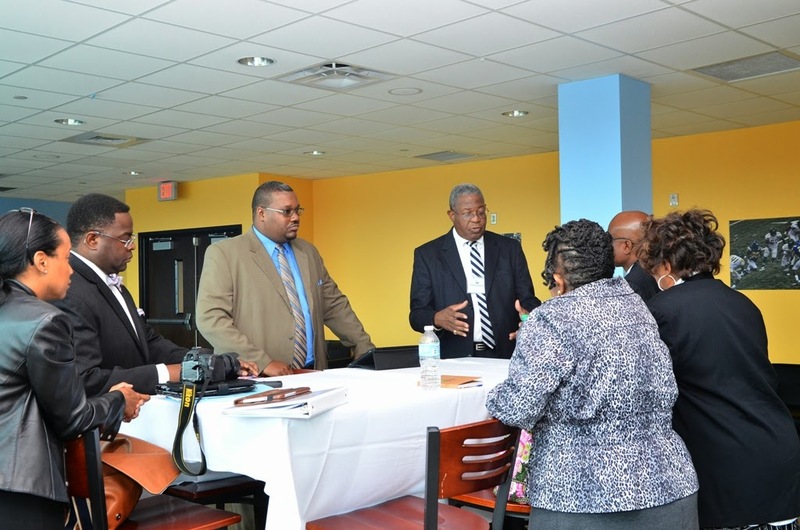 Also in attendance were Dr. Clarence W. Hawkins, Louisiana State Director, USDA Rural Development; Administrators, faculty and staff from the Southern University Ag Center and SU Baton Rouge Campus. 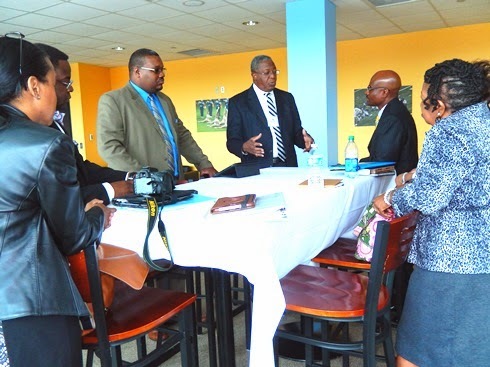 Dr. Juliette Bell reported that “the meeting was very engaging and provided opportunity for USDA and 1890 presidents to have an in-depth discussion about the future of both entities.” And she was very pleased about the experience. The afternoon agenda included an executive committee report and discussion focusing on new initiatives for the partnership; Summer Feeding Program presented by Ms. Audrey Rowe, Administrator, Food and Nutrition Service, USDA; Tree Campus USA Proposal, by Ms. Angela Coleman, Associate Deputy Chief, US Forest Service; and Mr. Dan Lambe, Vice President of Programs, Arbor Day Foundation. Dr. Bell and Mr. Tidwell gave closing remarks with an outline of next steps. When asked what the goal of the meeting was, Mr. Tidwell responded “This meeting brings leaders together to strengthen leadership in agriculture and reach out to the potential leaders in order to remain the world leader in agricultural sustainability.” We need to train, mentor, and prepare students to assume leadership positions. 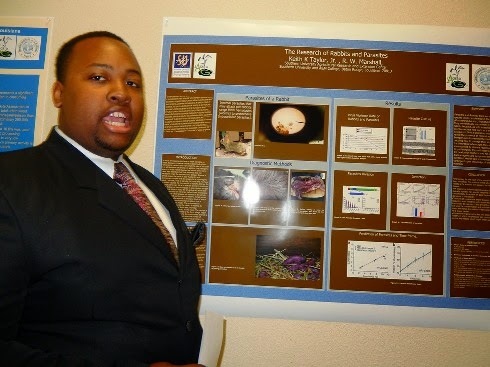 USDA/1890 Program’s mission is to attract students into careers in agriculture and related fields; share expertise and resources in areas such as agricultural research, extension and teaching programs, technology development, limited-resource farmers and minority farmer programs, and rural development programs; and to increase the involvement of the 1890 Land-Grant Institutions and Tuskegee University in the delivery of USDA programs. In response to the question of the caliber of students that Southern University selects to participate in the 1890 National Scholar’s Program, Ms. Phyllis Holmes says she is “very impressed with your scholars. They are well prepared academically and professionally, and they are very polite. I think it is the southern culture.” Ms. Holmes serves as the Acting Director, 1890 National Scholar’s Program, Office of Advocacy & Outreach, USDA. The 2014 Farm Bill gave Central State University, Ohio the land-grant status as the 19th 1890 Institution. This year, for the first time, Central State University is participating in the Task Force Meeting. 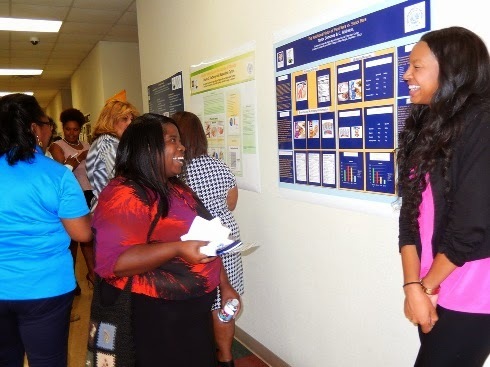 Baton Rouge, LA – The Southern University Agricultural Research and Extension Center celebrated the National Ag Day on March 25. State Commissioner Mike Strain, DVM, spent the evening with the SU Ag Center celebrating the 2014 National Ag Day. Commissioner Strain interacted with the SU and external communities, featuring a musical performance by the Scotlandville Middle Magnet School Choir and McKinley High School Jazz Band, along with agricultural exhibits. Chancellor Leodrey Williams and Executive Vice Chancellor and Vice Chancellor for Research, Adell Brown, Jr. brought greetings to the guests. The Ag Center welcomed SU students, faculty and staff to the celebration. Some distinguished members of the community came out in support of the event. 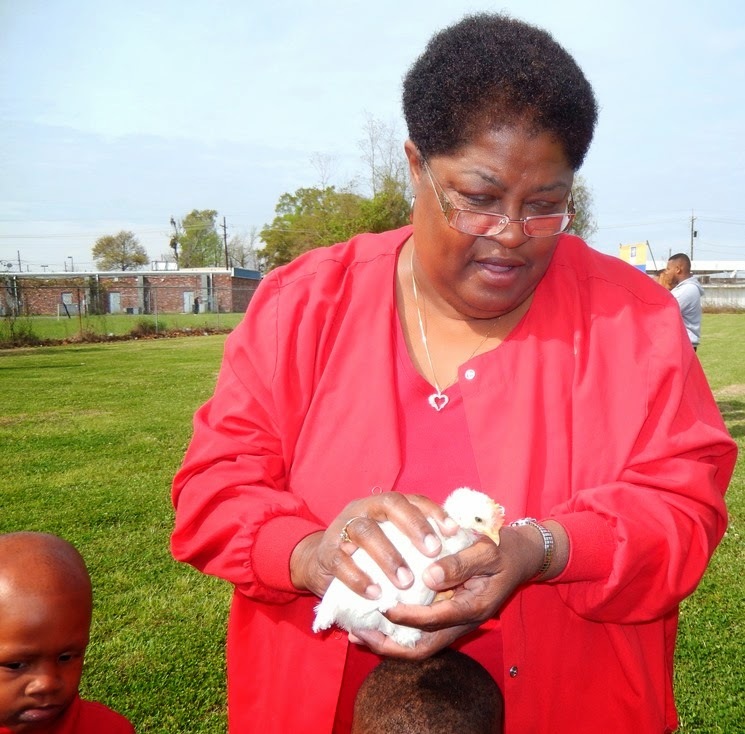 Among them were, Mrs. Gwendolyn Robinson, wife of the late Dr. George Robinson, long time professor of Animal Science at Southern University; Vereta Lee, District 2, EBR School Board, and Ronnie Edwards, District 5 Councilwoman. 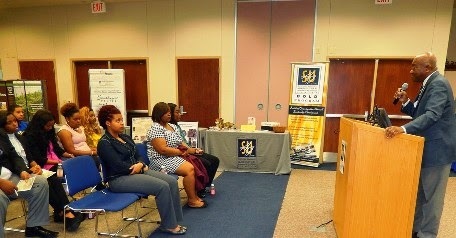 WAFB TV Channel 9 covered the event on the 10 pm news broadcast, March 25. 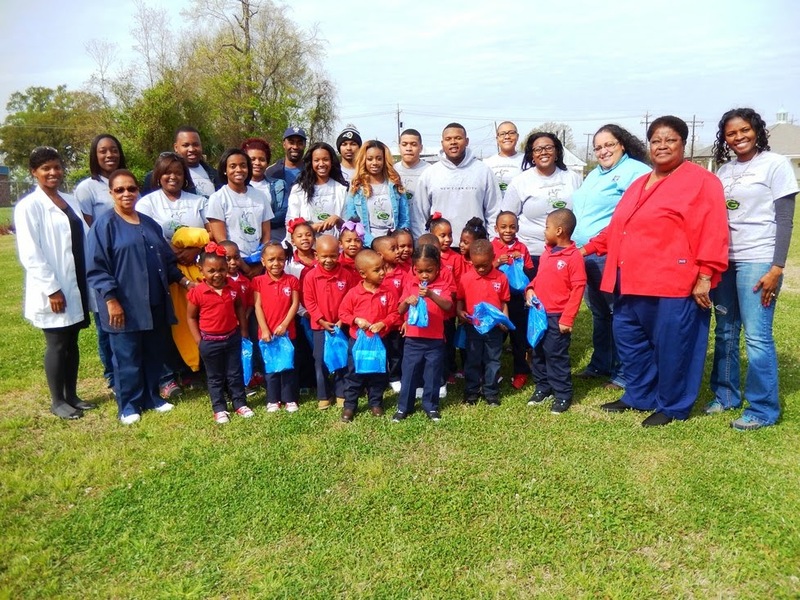 The celebration concluded this morning with “Adopt-A-Classroom” at Southern University Laboratory School where the Jags in Ag and Food Desert Project engaged youth in agriculture-related activities to teach them the impact of agriculture on their everyday living. A classroom full of 6th graders learned how to make ice cream in a bag, after a quiz on plant and animal sources of calcium such as broccoli, milk, cheese and fish. “This was a wonderful experience for the SU Ag Center, students, staff, faculty and the community. It afforded us an opportunity to share with the public the value of agriculture in our everyday lives and its profound impact on this country and the world,” said Dr. Renita Marshall, event coordinator. This workshop is free and open to all! Please RSVP by calling Zanetta Augustine at 225-771-2242as soon as you can. 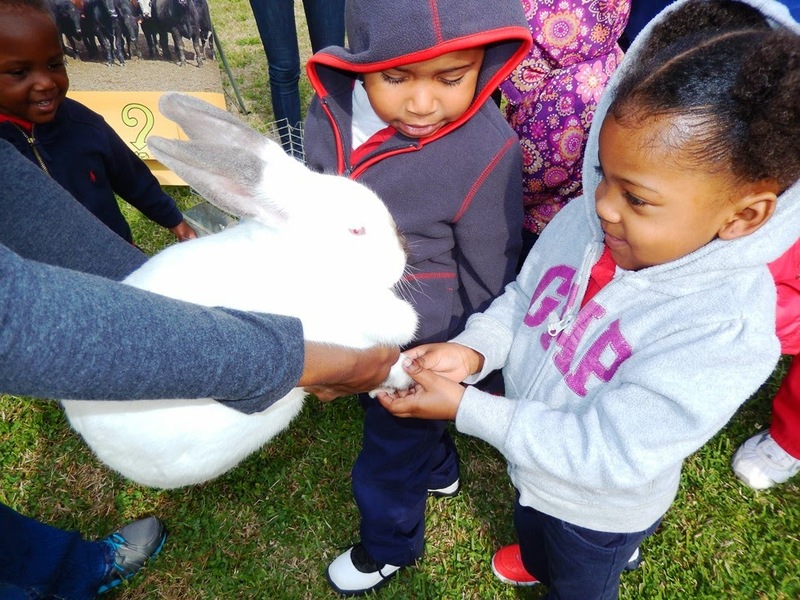 Pre-event activities included a Barnyard Display and Petting Zoo at St. Michael’s Episcopal Day School in North Baton Rouge where youth 2-5 years old along with their teachers were taught or reminded about the sources of food and benefits of agriculture. Southern University freshman students majoring in agriculture and involved in a mentoring program entitled “Jags in Ag,” joined SU Ag Center employees in exposing youth at St. Michael’s Day School to young animals like chicks, goat kids, and rabbits, and telling them about animal uses in daily life. Today, the National Ag Day kicked into full force with Ag Center Displays in A.O. 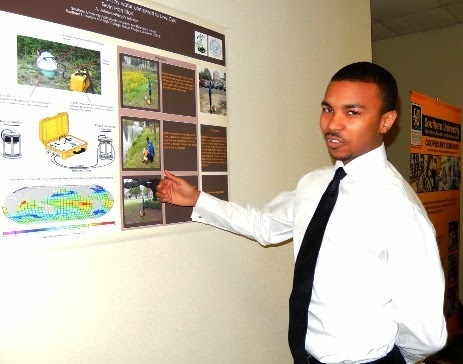 Williams Hall, along with Poster Presentations by JAGS in Ag students. 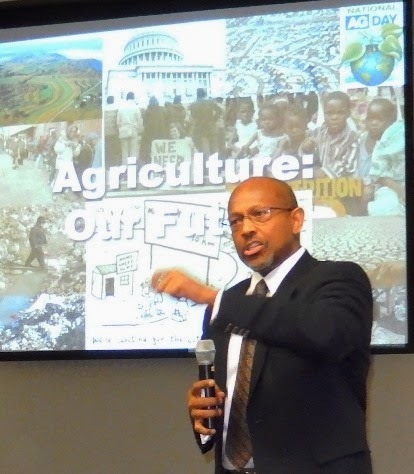 During his welcome address, Chancellor Leodrey Williams reviewed the history of the 1890 land-grant system, and provided insight into the future of agriculture. He concluded on a positive note that “There will always be a need for agriculture as long as people continue to eat, wear clothing and live in shelters.” There will always be a need for you and what you do, he told the faculty, staff and students in the audience. 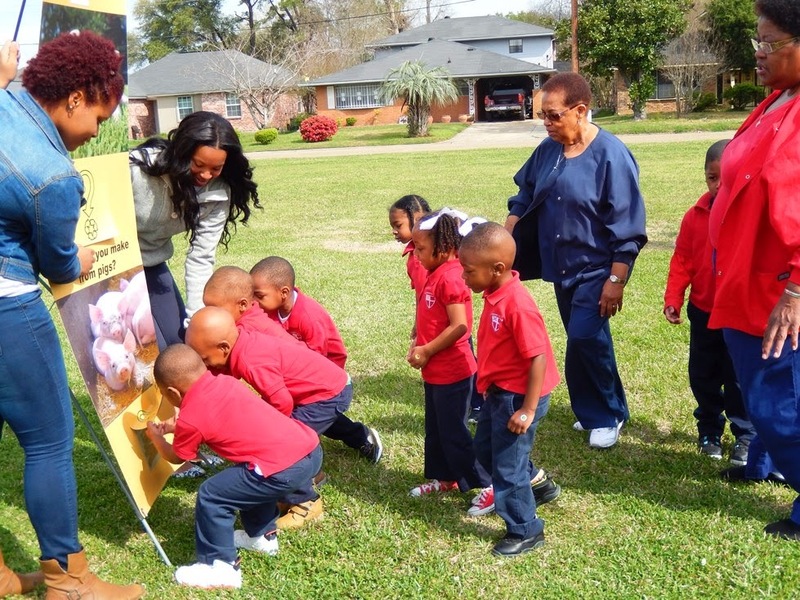 The celebration concludes on Wednesday with adopt-A-Classroom at Southern University Laboratory School where agriculture-related activities will be performed to teach youth how Ag affects their everyday living. “This is an opportunity for the public to understand the value of agriculture in our everyday lives and its profound impact on this country and the world,” said Dr. Renita Marshall, event coordinator who can be reached at 225-771-0252. Activities showcasing a Barnyard Display and Petting Zoo at St. Michael’s Episcopal Day School in North Baton Rouge ushered in the three-day celebration, in which youth 2-5 years old along with their teachers were taught or reminded about the sources of food and benefits of agriculture. 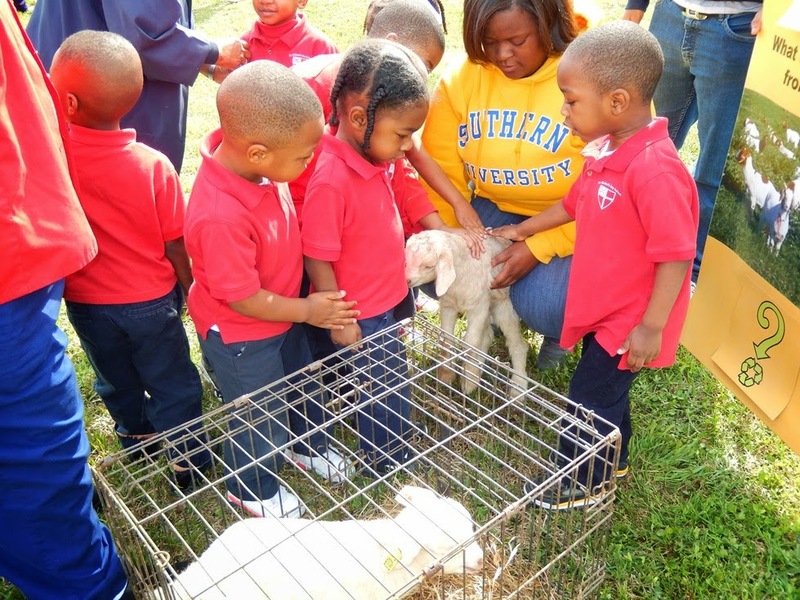 Southern University students majoring in agriculture joined SU Ag Center employees in interacting with the students at St. Michael’s School, showing them young animals like chicks, goat kids, and rabbits, and telling them about their uses in daily life. On Tuesday, the National Ag Day will kick into full gear with Ag Center Display in Rm. 191, A.O. Williams Hall, along with Poster Presentation by JAGS in Ag students followed by an evening reception with performances by Scotlandville Middle Magnet School Choir and a live jazz band from EBR public school. This event is by invitation. 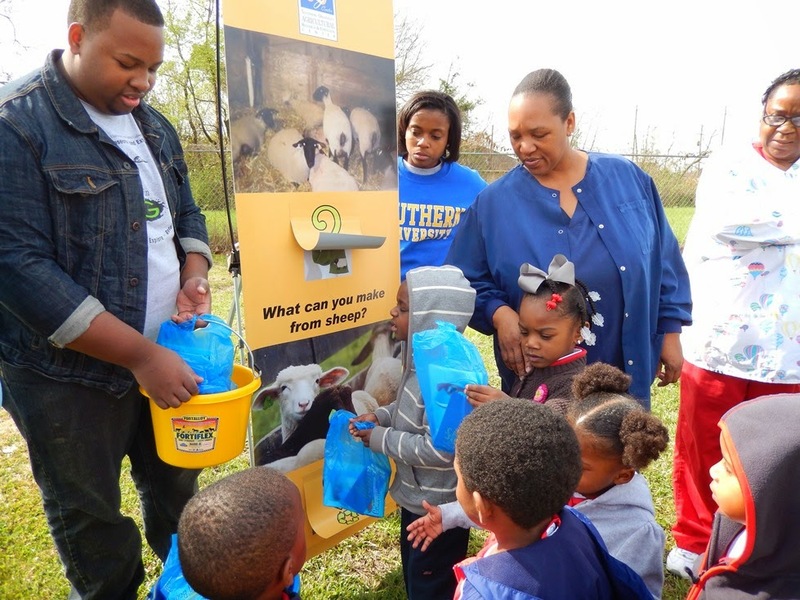 The celebration concludes on Wednesday with adopt-A-Classroom at Southern University Laboratory School where agriculture-related activities will be performed to teach youth how Ag affects their everyday living. 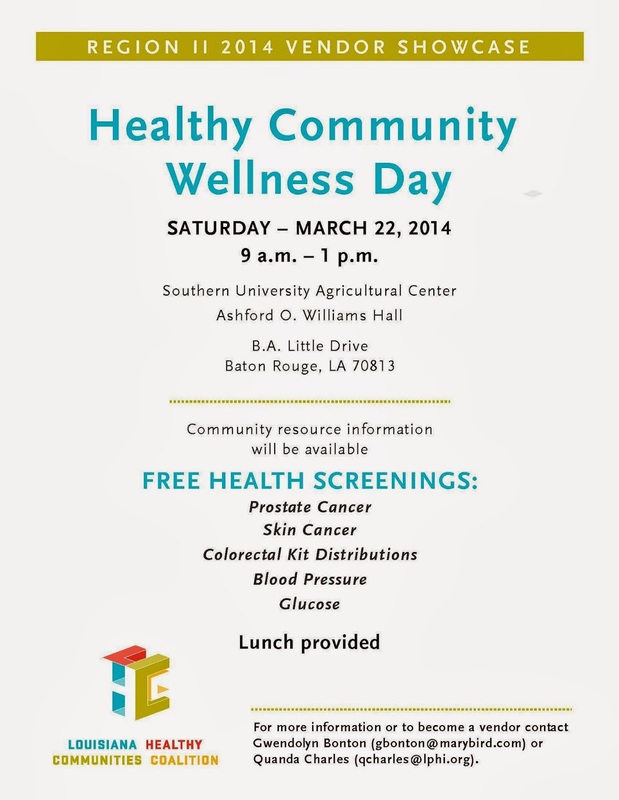 Baton Rouge, LA - The Louisiana Public Health Institute will hold a Healthy Community Wellness Day on SATURDAY, MARCH 22, 2014 at Southern University Agricultural Center, Ashford O. Williams Hall, 181 B.A. 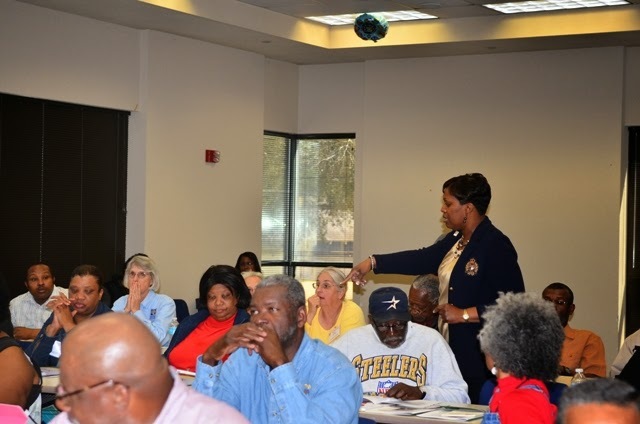 Little Drive, Baton Rouge, LA 70813, from 9 a.m. – 1 p.m. Community resource information will be available along with FREE HEALTH SCREENINGS: Prostate Cancer, Skin Cancer, Colorectal Kit Distributions, Blood Pressure, Glucose, and Lunch will be provided. Click here for flyer in PDF format - https://db.tt/i68Ps8N6. For more information or to become a vendor, contact Gwendolyn Bonton at gbonton@marybird.com or Quanda Charles qcharles@lphi.org. The event kicked off with a visit to the Red Stick Farmers’ Market, followed by a pre-conference grant writing session. The session titled, Understanding the Nuts and Bolts of the Southern SARE Program featured Mr. James Hill and Ms. Candace Pollock representing the Southern Sustainable Agriculture Research and Education (SARE) at Fort Valley State University/University of Georgia. 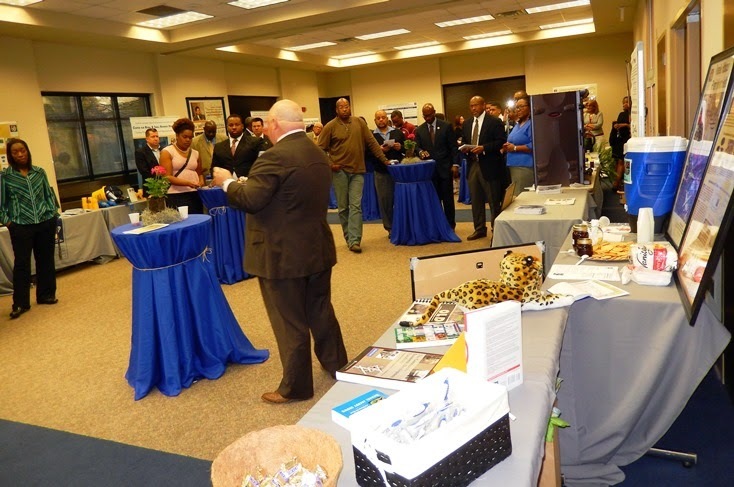 The Opening Reception at 5:30 pm on March 13 was sponsored by Southern SARE. On the morning of March 14, the conference thrust into full gear with the opening session presided by Dr. Dawn Mellion-Patin, Ag Specialist, SU Ag Center, and featuring Dr. Adell Brown, Jr., Executive Vice Chancellor and Vice Chancellor for Research; and Mr. Jeremy L. Hendrix, Special Advisor to the Commissioner on Minority Affairs, LA Dept. of Agriculture and Forestry. This was immediately followed by a keynote address entitled Meeting the Demand for Locally Grown Foods by Mr. Bobby Wilson, President, American Community Gardens Association, Atlanta, GA. The concurrent breakout sessions included: Backyard Flocks presented by Theresia Lavergne, professor/Poultry Specialist, School of Animal Sciences, LSU AgCenter; Diversifying Your Farm - Nelson Daniels, Program Specialist, Ag & Natural Resources, Prairie View A&M University; Soils: Composting as an Alternative - Bob Dillemuth, LA Master Gardener and Outreach Coordinator, Dept. of Public Works, EBR Recycling Office; Direct Marketing of Local Foods - Brennan Washington, Owner and Operator, Phoenix Gardens Farms, Lawrenceville, GA. The lunch presentation focused on the 2012 Ag Census: Implications for Louisiana Agriculture by Nathan Crisp, State Statistician, USDA/National Agricultural Statistics Service. Immediately after lunch was a panel discussion entitled USDA Programs and Services Designed to Aid the Production of Local Foods, moderated by Tiffany Franklin, Extension Associate, SU Ag Center. Panelists consisted of T. C. Chachere, Farm Loan Chief, Farm Service Agency: Microloan Program; Sam Willis, District Conservationist, Natural Conservation Service: Seasonal High Tunnel Initiative; Mary Kirk, Business and Cooperative Programs Technician, Rural Development: Value Added Producer Grants; and Orlando Phelps, Training Officer, Agricultural Marketing Service: Farmers Market Promotion Program. The evening culminated in the Louisiana Living Legend Banquet, highlighting three award recipients as “heroes with ties and connections to Southern University” for their years of selfless service. 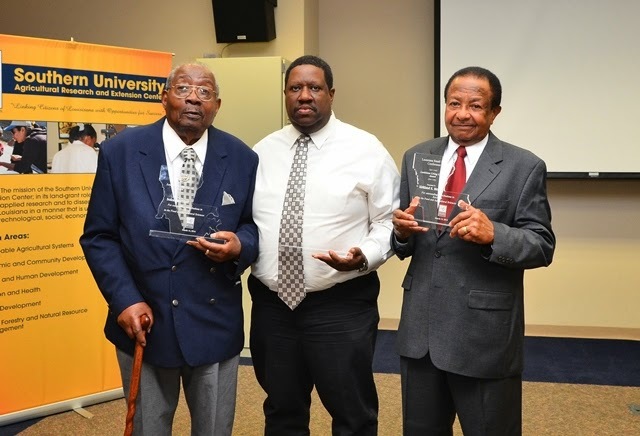 The 2014 Louisiana Living Legends were Mr. Wesley Crawford, retired Agricultural Extension Agent and mentor who served in Monroe, Morehouse and Franklin Parishes for 33 years; Mr. Solon Marshall, retired Vocational Agriculture Teacher who taught in Richland and Franklin Parishes for 37 years; and Dr. Kirkland E. Mellad, retired Vice Chancellor for Research, SU Ag Center with 39 years of service at Southern University. The event was coordinated by Dr. Dawn Mellion-Patin, Ag Specialist, and Zanetta Augustine, Associate Extension Specialist, SU Ag Center. 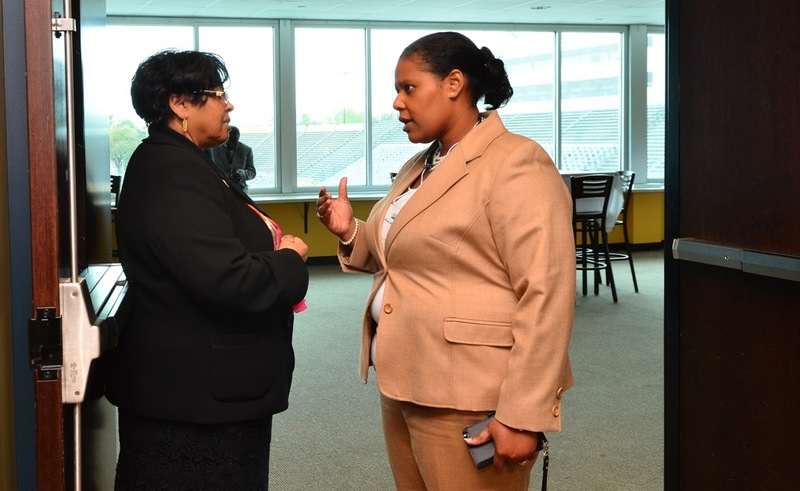 Dr. Gina E. Eubanks serves as vice chancellor for Extension. 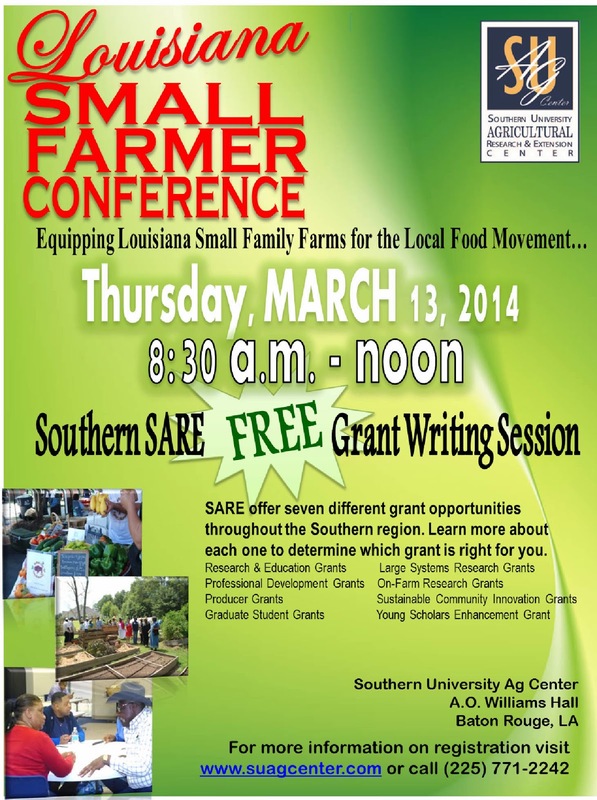 Baton Rouge, La - USDA Announced Efforts to Expand Support for Small and Mid-Sized Farmers and Ranchers on March 10, 2014. Agriculture Secretary Tom Vilsack made the announcement in remarks at the National Farmers Union National Convention. 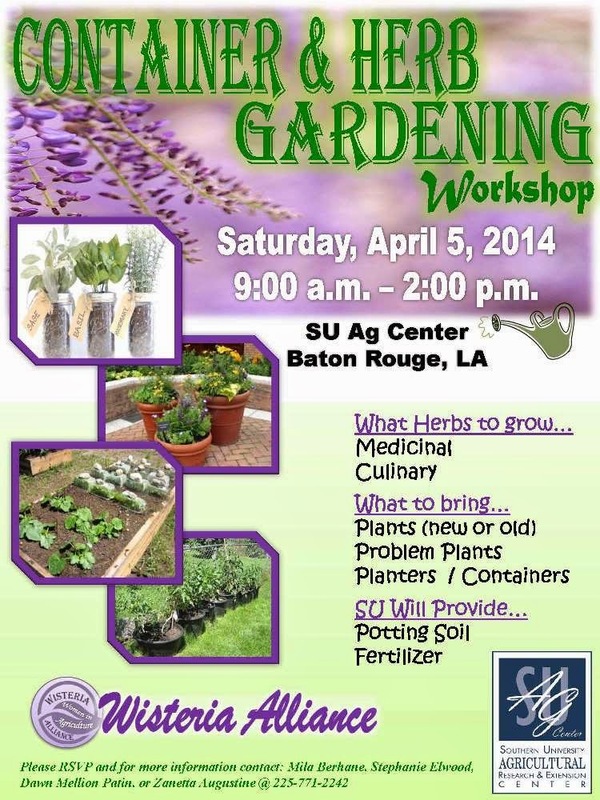 The SU Ag Center’s target audience consists mainly of small farmers and producers in Louisiana with regional impact. The step taken by USDA to make these resources accessible in one place is timely for growing rural economy. Small and midsize producers provide new opportunities for American Agriculture across the country. This page provides small and midsize producers valuable resources and program information about access to capital, land management and conservation practices, managing risk, finding local markets, and other educational resources. USDA has made changes to the Farm Storage and Facility Loan (FSFL) Program to help small and midsized fruit and vegetable producers access the program for cold storage and related equipment like wash and pack stations. Diversified and smaller fruit and vegetable producers, including CSAs, are now eligible for a waiver from the requirement that they carry crop insurance or NAP coverage when they apply for a FSFL loan. FSFL can also be used to finance hay barns and grain bins. Funding for producers under the popular microloan program. USDA launched the Microloan Program to allow beginning, small and mid-sized farmers to access up to $35,000 in loans using a simplified application process. Learn more about the Organic Certification Cost Share Program. USDA is developing tools to help small and midsized farmers and ranchers make sound financial decisions as they plan for their future including a whole farm insurance policy that will better meet the needs of highly-diversified producers, particularly small and midsized fruit and vegetable growers. 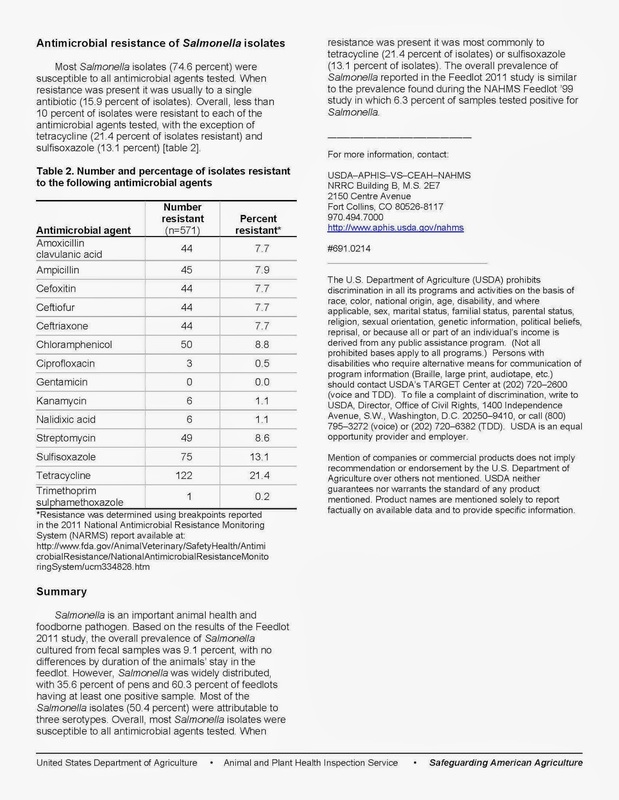 More information is available through USDA's Risk Management Agency. USDA's Farm to School Program has put seven new Farm-to-School Coordinators on the ground in regional offices to help build direct relationships between small and mid-sized producers and school districts. One priority area for Farm to School is creating more opportunities for small and mid-sized livestock and poultry producers. Market News is now collecting price data on grass-fed beef to arm producers with real pricing information from the sector. Market News will also soon begin collecting data about local food prices and volume, valuable to small and mid-sized producers engaged in that marketplace. The USDA National Farmers Market Directory will be broadened to include CSAs, on-farm stores and food hubs. This information will help small and mid-sized producers find new market opportunities. In addition, NRCS's Hoop House Program continues to extend the growing season and revenue opportunities while also promoting conservation for small and mid-sized farmers. USDA has launched pilot projects in five states to help small and mid-sized farmers achieve Good Agricultural Practice (GAP) certification. GAP certification indicates farmers have met food safety standards required by many retail buyers. Group GAP efforts are being developed in partnership with small and mid-sized producer groups in Michigan, Wisconsin, Montana, Pennsylvania and Missouri. USDA has created a Learning Guide Series for small and mid-sized producers to help them navigate available USDA resources. The first in this series will be for small and mid-sized livestock and poultry producers. Additional Learning Guides will be released later this year and will be available on the Know Your Farmer, Know Your Food website. In addition, the Natural Resource Conservation Service (NRCS) has launched Small Scale Solutions for Your Farm, a series of educational resources designed for both small livestock and fruit and vegetable producers. Start2farm.gov also serves as a one stop shop for beginning farmers and ranchers to learn about how to get started. While not all small and midsize producers are new or beginning, many do start out small. Value Added Producer Grants can help farmers and ranchers develop new products, create and expand marketing opportunities, and increasing producer income. The Farmers Market and Local Food Promotion Program (previously known as the Farmers Market Promotion Program) supports development and marketing activities for farmers markets, food hubs, roadside stands, agri-tourism activities and other producer to consumer markets. This support can help small and mid-sized farmers to access markets. 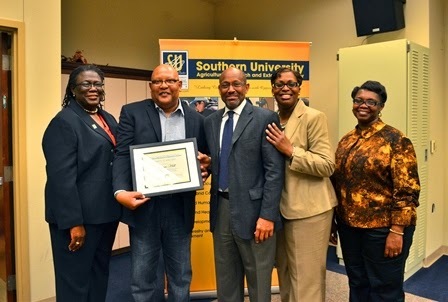 Baton Rouge, La – 2014 marks Southern University’s 100th year on the Bluff. During this year’s Founders Day, festivities kicked off with a Community Prayer Breakfast, followed by Convocation and Employee Awards and Recognition Luncheon, as part of the Centennial Celebration. SU Ag Center faculty and staff received employee service awards during the Founders Day, 100th Year Celebration Luncheon on March 10. The following SU Ag Center employees received service awards: Eual Hall, Business Development Outreach Specialist – 20 years; Sebhatu Gebrelul, Professor – (Animal Science) - 30 years; Zhu Ning, Professor (Urban Forestry) – 20 years; Patricia Meyinsse, Professor (Agricultural Economics) – 30 years; and Ernie Hughes, SUS Director of Community Development (formerly Community Development Specialist) – 20 years. 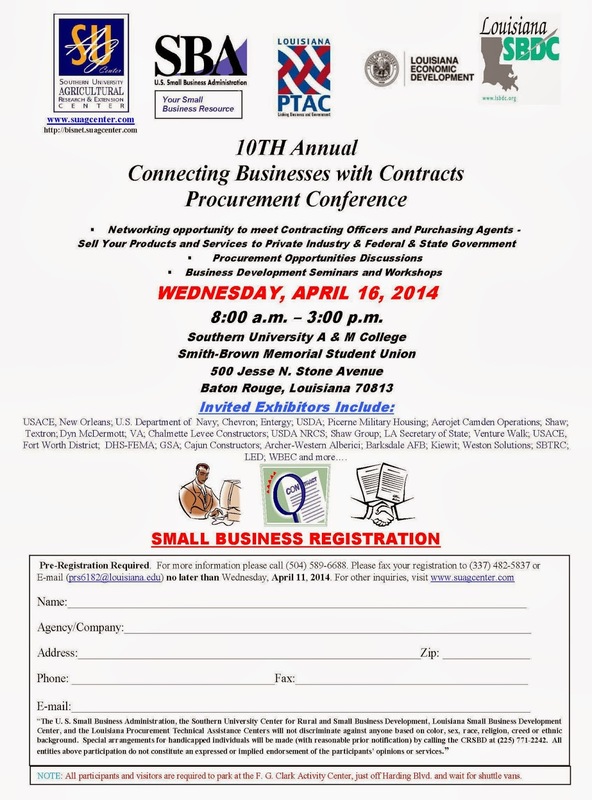 BATON ROUGE, LA - The 10th Annual Procurement “CONNECTING BUSINESSES TO CONTRACTS CONFERENCE” will take place at Southern University Smith Brown Memorial Union, April 16, 2014 on the Baton Rouge campus. The goal of the conference is to stimulate the economy by aligning existing and potential business owners, small contractors, non-profit organizations, and others with contracting officers, and purchasing agents, as well as providing an outlet to network and exchange information and ideas. 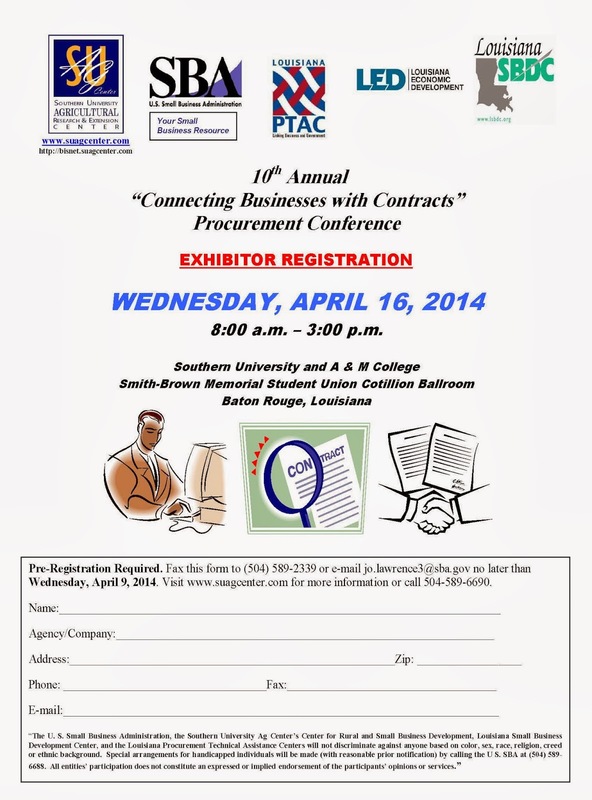 Exhibitors are required to pre-register by April 9 and participants by April 11, 2014. Registration forms are available online at: http://www.crsbd.com/events/registration/. 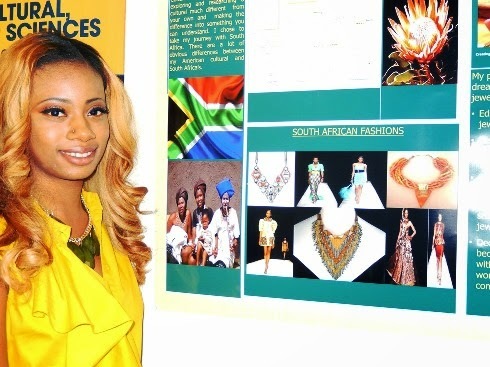 Also, you can click on this link to download exhibitor form https://db.tt/Jlg3UeR7 or here for participant registration form https://db.tt/48cBXj37 in PDF format. Expected presenters and exhibitors to represent their companies include: Entergy, Inc., Regions Bank, Liberty Bank and Trust Company, SBA Surety Bond Brokers, South East Procurement Technical Assistant Center, USDA Rural Business Development, (Federal & State) Office of State Purchasing, Baton Rouge City Purchasing Department, LSU Purchasing Department, Southern University Purchasing Department, Louisiana Small Business Development Center, Louisiana State Contractor Licensing Board, Louisiana Housing Finance Agency, The Shaw Group, Capital One Bank, Louisiana Department of Labor, Louisiana Department of Economic Development. Other potential exhibitors include: United States Department of Commerce, Secretary of State’s Office, and Louisiana Department of Workers’ Compensation, Department of Veterans Affairs, FEMA, DoE, Bureau of Prisons, GSA, Minerals Management Service, U. S. Coast Guard, Louisiana National Guard, Dept. of Navy, and Shaw Industries. 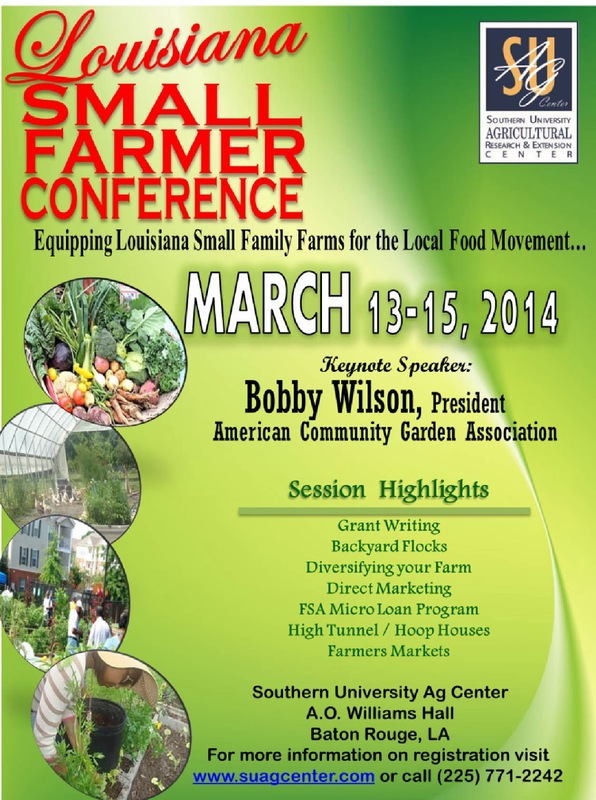 Baton Rouge, LA – In a few short weeks, Southern University Agricultural Research and Extension Center will hold its Annual Louisiana Small Farmer Conference, MARCH 13-15, at the SU Ag Center. This conference is designed for small farmers who are interested in building up existing farms, transitioning or moving towards diversifying family farms and need assistance. Conference topics include: Grant Writing, Backyard Flocks, Diversifying your Farm, Direct Marketing, FSA Micro Loan Program, High Tunnel / Hoop Houses, and Farmers Markets. Farm Tours will also be part of this conference. Registration is required and can be submitted online via e-mail. Form is available at https://db.tt/Twi7bmt7. Onsite registration will cost $25.00. For more information or registration form, please contact us by email at zanetta_augustine@suagcenter.com, or phone (225) 771-2591. We look forward to seeing you and your family at this year’s conference. 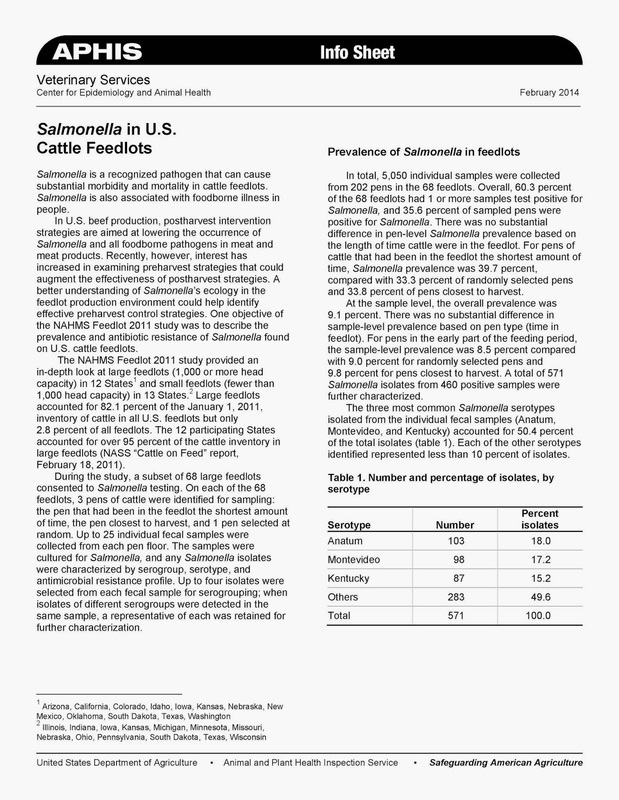 Baton Rouge, LA - USDA's National Animal Health Monitoring System (NAHMS) has released an info sheet from its Feedlot 2011 study—“Salmonella on U.S. Cattle Feedlots.” The Feedlot 2011 study took a broad look at animal health and management practices on feedlots throughout the major cattle feeding regions of the United States. Click here to view the information sheet. 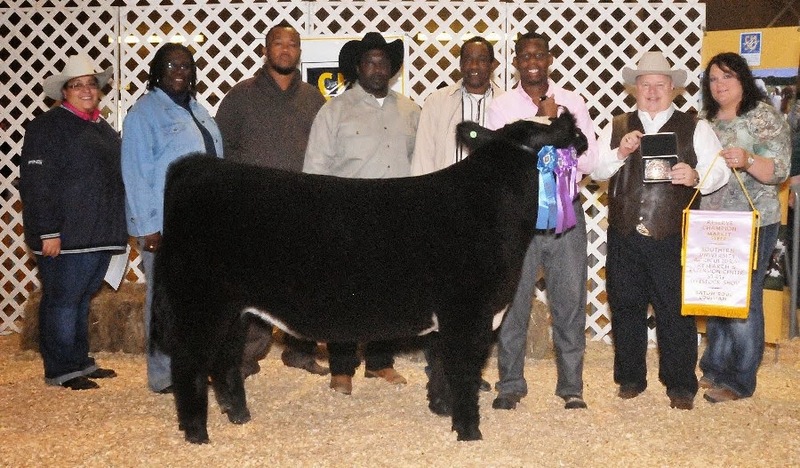 Baton Rouge, LA –The Southern University Agricultural Research and Extension Center concluded its 71th Annual Livestock Show with more than 350 participants from across the state this past weekend. On the heels of last year’s landmark 70th Anniversary event, the show continues to provide youth with opportunity to learn leadership and life-long skills, and build friendships for life. During the three-day event, young farmers and ranchers from across the state had the opportunity to display animals that were showcased or had won in parish competitions. 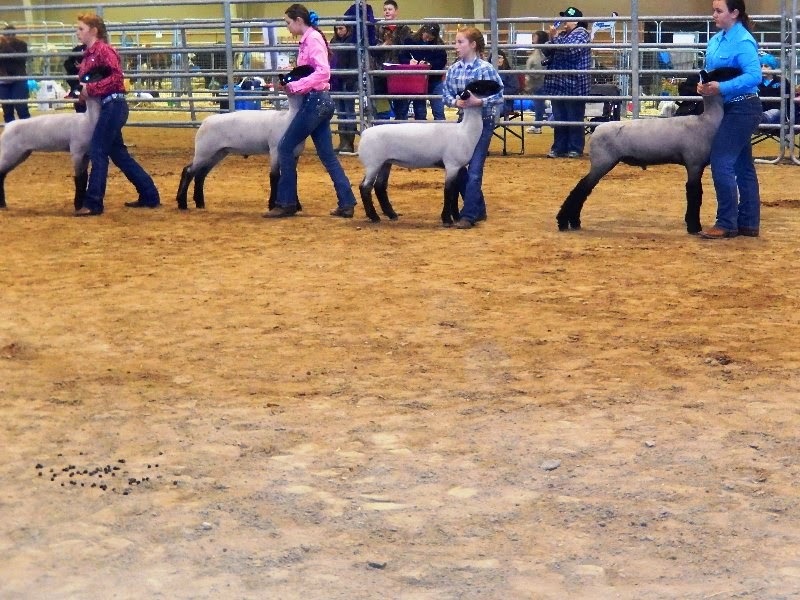 After the show, judges named state champions in various breeds of beef and dairy cattle, swine, sheep, lamb, and goat. The all-time favorite mini-farm, featuring a variety of small farm animals, plants, and tours attracted school-age youth in excess of over 500 from local area schools. Tour stops explained different animals, their food sources, farming, and how agriculture affects everyday life. There were petting zoos for goats, rabbits, chicken and even duck. Other stops included demonstrations of SU Ag Center programs for families in the area of nutrition, tobacco cessation, veterinary care, gardening and a milking station. Winners received premiums, rosettes, ribbons, and banners. An awards presentation for exhibitors of champion market animals was held, followed immediately by the Junior Auction Sale.